1. Are there any airports located near Moab? Yes! Canyonlands Field Airport (CNY) is located 18 miles north of Moab. The Moab airport is scheduled to open for flights on April 30, 2018 with Skywest dba United Express being the carrier. The closest major airport to Moab is located in Salt Lake City (236 miles from Moab - 4 hour drive). Walker Field Airport, located in Grand Junction Colorado (110 miles from Moab - 1 hr 45 min drive), provides the closest option for most airlines. 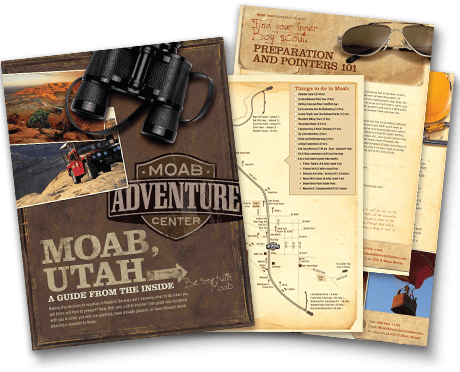 Learn more about getting to Moab, Utah. 2. How is the heat in the summertime? Our hottest months here in Moab are June through September; July often reaching temperatures of 110 degrees. Keep in mind that this is a dry heat, so you may not feel like it is as hot as more humid parts of the country; but this can actually be quite dangerous if you are not listening to your body and keeping it plenty hydrated. It is recommended to have at least 2 liters of water per person with you at all times. Summer visitors to southern Utah often spend the morning enjoying mountain biking, horseback rides, and hiking and then spend the afternoon pursuing activities such as rafting or 4x4 trips. Popular evening activities are sunset Hummer Safaris or Sunset Jetboat. Click here more information about climate and weather in Moab. 3. Are there any supermarkets in Moab? 4. Where can I find public internet access in Moab? Several businesses and most hotels offer wireless internet. You can stop by the Moab Adventure Center at 225 S Main anytime and pick up a connection. You'll find tables outside on the patio. Many of the local cafes and coffee shops also offer complimentary wireless. 5. Are there any hospitals in Moab? Yes, Moab Regional Hospital is a 17-bed critical access hospital, and is the leading healthcare facility in the southeastern region of the state, serving thousands of patients each year. Services include a full-service emergency room, general and orthopedic surgical services, primary care physicians, obstetrical services, and a wide-range of other specialists. 6. Are there any Automated Teller Machines in Moab? Yes, Moab contains quite a few ATM's. In addition to ATM's at Wells Fargo Bank and Zion National Bank, the supermarket and quite a few convenience stores also contain ATM's. 7. What activities are there in the Moab area to enjoy with small children? Children under 5 generally love shorter 4x4 tours and exploring the sand and redrock on shorter hikes. There are also many short trails in Arches National Park that small children can enjoy. In particular, Sand Dune Arch contains a massive sand pile beneath the arch which is always popular with kids. For kids over 5 years old, half-day rafting trips or scenic flights are a good choice. Children over 10 can enjoy horseback riding or mountain biking. Additionally, the town of Moab contains a water park and public swimming pool. 8. What Gas Stations are located in Moab? Moab contains numerous gas stations including Shell, Phillips 66, Texaco, Maverick, Chevron, and 7 Eleven. 9. Can I hike with my pet? Activities with pets are very limited within the National Parks of southern Utah. Pets are prohibited from the back country as well as on trails. In authorized areas, pets must be leashed at all times when outside a vehicle and may be walked only on roads or in parking lots. Pets may accompany visitors in campgrounds. Please remember that the climate of southeastern Utah is considered to be an arid desert. Summertime temperatures inside a closed vehicle can reach life threatening levels in a short period of time. Therefore, it is not recommended that you leave your pet in a vehicle. 10. Is there any live music at night in Moab? Yes! The following establishments often feature live entertainment on the weekends. Check with each establishment for their current schedule. 11. What are the current road conditions in southern Utah? 12. I've been backcountry camping for over a week. Can I get a shower in Moab? 13. Is there any Daycare available in Moab?